The last week of the HRC session began with the Annual Discussion on the Integration of a Gender Perspective. The panel discussed issues of import that still affect women in some parts of the world such as female genital mutilation and sexual violence in prisons. But there appears to be some hope of improving gender perspective and integration through the Universal Periodic Review (UPR). Gender-related recommendations are the second most prevalent theme in the UPR; however, we were reminded of the Chinese saying that “the blossoming of a single flower does not indicate it is springtime” so further scrutiny needs to be conducted to ensure quality and action-oriented recommendations on the topic of gender integration. The majority of the week was taken up on Item 10 of the Council’s agenda, which refers to reports on technical assistance and capacity building for States. On the agenda were reports on the States of: Cambodia, Yemen, the Democratic Republic of the Congo, Libya, Burundi, the Central African Republic, Somalia, the Sudan and Ukraine. Several of these States, such as Cambodia and the Sudan, did not agree with the detailed information that the Special Rapporteurs and Independent Experts reported to the Council. However, these reports still serve a good purpose of assessing and addressing the human rights situations of these countries, and are further strengthened within the extension or new appointments of their mandate holders. The last day and a half was reserved for the adoption of 30 resolutions on a wide range of issues. 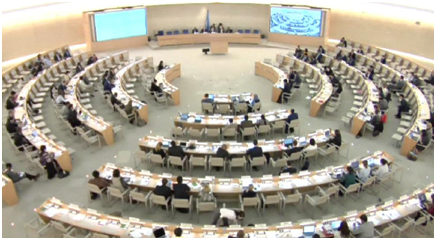 IIMA welcomes the adoption of the resolution on unaccompanied migrant children and adolescents and human rights that was introduced by the delegation of El Salvador. The resolution calls on States to facilitate family reunification as appropriate as an objective that promotes the welfare and best interests of these children. In addition, it called the Council to convene a panel discussion on the topic at its 35th Session. The Council also adopted the outcomes of the UPRs of 14 States, appointed five mandate holders, and seven new members to the Council’s Advisory Committee. Of note was the three-year appointment of a Special Rapporteur on the right to development whose mandate will include contributions to the implementation of the 2030 Agenda for Sustainable Development. Council President Choi Kyong-lim concluded the 33rd session with some remarks about allegations of intimidation and reprisals that were received during the session, particularly against civil society representatives and human rights defenders, which he denounced as he stressed the importance of civil society participation in the Council. The 34th session of the Human Rights Council will take place from 27 February to 24 March 2017. Please visit the Council’s webpage for further information, documents, reports, etc. on the 33rd session.